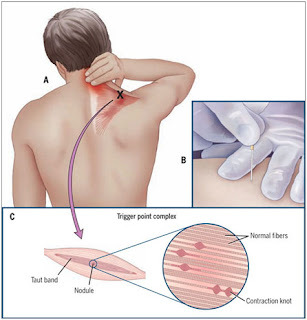 Physical therapists routinely evaluate individuals for painful "trigger points' that can result in not only pain but, also limited movement and tolerance for activity. If these areas of muscle hypersensitivity are not identified and then addressed therapeutically, they can result in a prolonged and sometimes chronic painful condition. The "dry needling" component is simply a means of better allowing a technique to specifically zero in on and "reset" the muscle tissue that is hypersensitive. As the name implies, dry needling involves the use of thin needles of varying length without anything "wet" going into or out of the body. No medications or solutions are injected and most of the time no blood exits the body as the needles are a fraction of the size typically used for injections or for drawing blood. The targets for these needles are trigger points which are taut bands (nodules) found within muscles that can be irritable and painful with pressure or palpation's and often times result from our body's response to injury. When activated by pressure or irritated by injury or activity, they can reproduce an individuals pain at the site of the trigger point, or even in a seemingly unrelated location of the body, which may then result in a loss of motion or a decrease in function. Since these identified areas of hyper sensitivity are ultimately the targets for part of our treatment regimen, it makes sense that dry needling is often called trigger point dry needling (TPDN). Trigger points and muscle dysfunction (i.e. tight muscles or muscles that are not working properly) have been recognized since the 1950s and have been something physical therapists have been trained to correct with a variety of treatment approaches. Stretching strengthening, therapeutic ultrasound, lasers, electrical stimulation, joint mobilizations, manipulation, as well as various techniques using thumbs elbows, and or tools have all been utilized and will continue to be used to address these problems. Dry needling for trigger points was first used in 1979 when a physician found that using injections into trigger points to alleviate pain worked regardless of the medication used. The needle actually seemed to be the source of the pain relief. The rationale to explain how a skillfully placed needle into a muscle can result in a significant reduction of pain isn't completely understood. Perhaps the needle causes a very specific and localized stretch to the taut fibers within the trigger point which then results in a 'twitch' response which ultimately renders the muscle to be less sensitive to movement. Another theory is that there may be a localized increased chemical release or 'leak' of the chemical that causes a muscle to contract which may lead to incomplete relaxation of the affected area. The needles may be enough of an irritant to the structure that is leaking the chemical that it releases more, resulting in a localized muscle twitch. This may then use up the excess chemical which then ultimately helps to shut off the leak leaving behind a more relaxed muscle. No matter what the exact mechanism is for why a needle in a trigger point makes it act differently, the result is a muscle that has been reset, no longer holding unnecessary tension or acting inhibited from performing its role in helping the body move. This reset is often compared to the Control-Alt-Delete function on a computer effectively causing it to 'forget' whatever it was causing the problem!